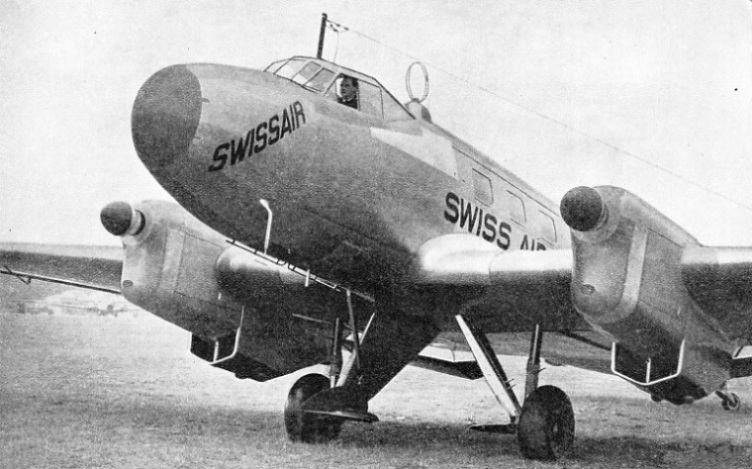 A SWISSAIR PASSENGER MACHINE equipped with Lorenz radio apparatus for making blind approaches to an aerodrome. The Lorenz system works on ultra-short wavelengths, and two aerials are fitted to the aircraft in addition to those used for other radio purposes. 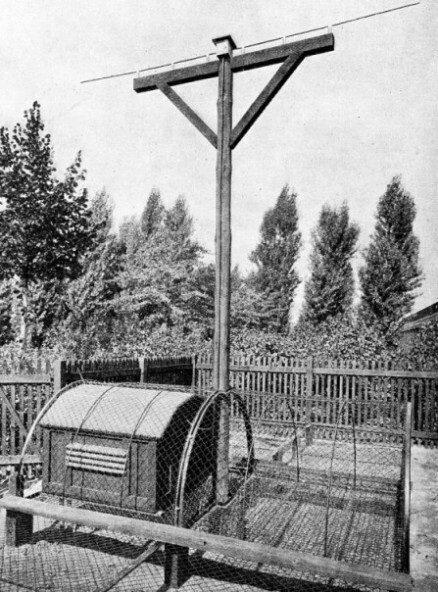 One of the aerials consists of two short rods, visible in this picture below the nose of the machine. The other is a short, vertical-rod, and is generally accommodated on the side of the short mast which supports the aircraft’s fixed aerial. This mast is visible above the pilot’s cabin. THE first commercial air line, started after the war of 1914-18, had not long been in operation before the drawback of bad weather in the maintenance of regular schedules became apparent. Engineers, designers and technicians were soon engaged in seeking means of removing the difficulties. New machines overcame strong and squally winds. Radio communication proved a great help. Fog and low cloud, however, were by no means so easy to circumvent. Mechanical and radio sciences have since achieved a victory in making possible the maintenance of services on all but one or two of the worst days of a year. “Blind” flying in cloud or fog is today a commonplace event, and is carried out with remarkable safety. In normal flight the pilot is able to judge the attitude of his machine by noting the relative position of the horizon. Should the necessity of flying in clouds arise, however, or should visibility be so poor that the horizon and ground are obscured, then other means of determining the aeroplane’s attitude must be used to maintain successful flight. Any attempt to depend on physical reactions to determine the machine’s attitude is impracticable. In such conditions a machine could go into a spin without the pilot being aware of the manoeuvre. Sense of balance is provided by the inner ear and the “deep muscle sense”, but these reactions depend mainly on the force of gravity for their reactions and cannot distinguish between that pull and other effects such as centrifugal force and acceleration forces. Thus the pilot is obliged to rely on instruments when flying blind. These instruments have to give him the information he would gather from watching the horizon if visibility were good. They have to tell him when the machine is flying level, when climbing, when diving or gliding, when it is banked, and when turning. Instruments for blind flying differ in the ways in which they convey their indications, and also in the principles on which they operate. Two instruments extensively used by commercial air lines are the Sperry-Horizon and the Directional Gyro. One of the advantages of these instruments is that they give a direct-reading picture of the machine’s movements in relation to the horizon. Their indications require no interpretation. In the Sperry-Horizon there is a small picture of an aeroplane in flight in the centre of the instrument face, across which are two parallel lines indicating the horizon. With the miniature aeroplane nestling between the two white lines, and with its wings parallel to them, level flight is indicated. PILOT’S COCKPIT of a Tiger Moth equipped for blind flying. The upper three instruments are engine revolution counter, turn indicator and air speed indicator. Below, from left to right, are clock, inclinometer, compass, altimeter and engine oil-pressure gauge. 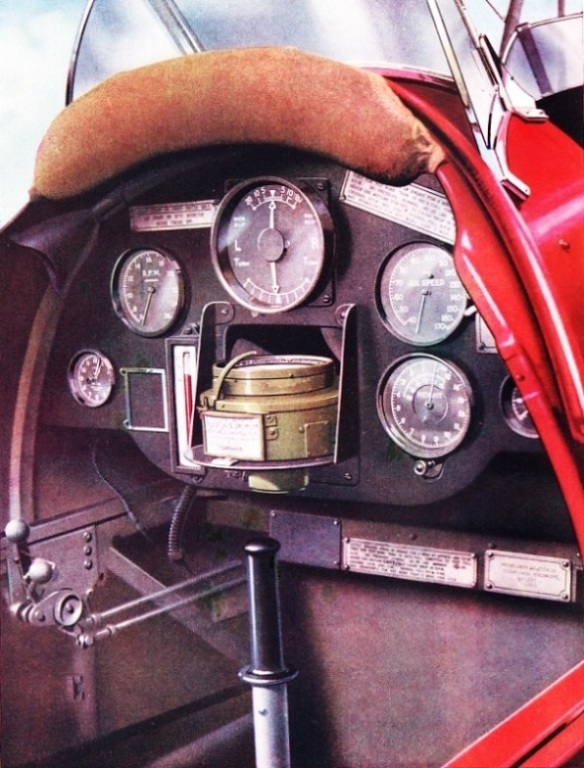 The longer of the two ball-topped levers to the left of the picture is the throttle, and the shorter the mixture control for use when flying high. The label to the left of the turn indicator reads: “Start engine on front switch only. Try engine on both magnetos before taking off”. On the label to the right of the turn indicator are the words: “Gipsy Major. Warm up engine for 4 mins at approx. 800 rpm. Then for not more than 10 secs full throttle to test full rpm. Oil pressure normal 40-45 lb. Min. 35 lb. Never use mixture control to cause drop in rpm. Cruising rpm 1,900-2,050. Normal full rpm 2,100, Max permissible for not more than five minutes 2,350 rpm.” Of the three labels below the compass, the centre one is the same as the one to the right of the turn indicator, the one on the left has the aircraft maker’s name and number of the machine, and the one to the right has the words: “Brooklands Aviation, Ltd, Brooklands Aerodrome, Byfleet, Surrey” the owners of the aircraft. These two instruments enable a pilot to fly as he pleases without once seeing the horizon or the ground. The Sperry-Horizon tells him when he is flying level, when climbing and when gliding or diving. It also indicates the angle of his climb or glide. To make a turn the pilot has to bank the machine and to put on rudder, so when making a turn he watches both instruments. The degree of bank required varies with the rate of turning. Just as an inexperienced pilot, even when the horizon is visible as a guide, can cause skid or sideslip by incorrect bank, so skid or sideslip can occur when flying blind. To indicate their presence to the pilot a small, curved ball-bearing level may be affixed to the Directional Gyro. When a turn is being properly made - that is, with the correct amount of bank - the ball bearing will remain exactly in the centre of its tube. Both the instruments described operate on a gyroscopic principle. A gyroscope is, basically, a wheel so mounted that its axle can be pointed in any direction. When spinning, the wheel holds itself, against pressure, in the plane in which it is rotating. In the Directional Gyro, the wheel is spinning on a horizontal axis at approximately 10,000 revolutions a minute. Its axle is supported in a gimbal ring which permits its universal movement. The card bearing the degree markings is carried by the outer casing of the gimbal ring, so that it remains fixed with the spinning wheel, so far as movement around a vertical axis is concerned. The lubber line is solid with the aeroplane; therefore, as the aeroplane turns, the lubber line moves round the scale of the instrument. A device for setting the scale of the Directional Gyro is provided, so that a reading of 0 degrees may be obtained when the machine is on the correct course as indicated by the magnetic compass. In the Sperry-Horizon, also, the spinning wheel is mounted in a gimbal ring, and no matter in what position the aeroplane flies, the plane of the spinning wheel remains fixed. The spinning wheel is mounted on a vertical axis, and the white horizon lines remain parallel to the outer casing of the gimbal ring. Because the miniature aeroplane is solid with the machine, it will twist in relation to the horizon lines as the aeroplane banks round the gyroscope. By means of pins attached to the inner casing of the gimbal ring, and protruding through slots in the outer casing, the arms carrying the horizon lines can be moved in a parallel sense, upwards or downwards, as the machine is made to climb or glide. They thus alter the position of the horizon lines in relation to the miniature aeroplane on the instrument face. A LORENZ MARKER BEACON. This is the outer of the two marker beacons at the Tempelhof aerodrome, Berlin. The aerial consists of two horizontal metal rods, mounted on insulators and connected by a special feeder to the transmitter. A marker beacon transmits a vertical radiation which operates a device on the instrument board of the aeroplane, and thus informs the pilot when he is over the beacon. Both these blind flying devices are operated by means of suction, produced by an engine-driven vacuum pump or by venturi tubes. The suction causes jets of incoming air to impinge on small buckets on the gyroscope wheel. The arrangement may aptly be described as a miniature air turbine. A venturi tube is an open tube tapering inwards from both ends. It is mounted outside the fuselage of the machine, and the force of the air passing through it produces a strong suction across a small hole in the side of the tapering tube. This suction is applied to operate the instrument. Another pair of instruments which enable a pilot to fly blind are the inclinometer and turn indicator. The inclinometer, or fore-and-aft level, is a glass tube in which liquid rises when the aircraft is climbing and drops when the aircraft is descending. A mark at the side of the tube indicates the liquid’s height for level flight. The turn indicator has two pointers (see diagram below). The lower one indicates the rate of a turn to right or to left, and the upper shows when the degree of bank is correct, insufficient or is too great. To make a correctly banked turn at any desired rate, the pilot keeps the lower pointer steady at the desired point, and maintains the upper pointer in the centre. If the upper pointer moves to the right the pilot moves the stick to the left. And if the pointer goes to the left the stick requires to be moved to the right until the pointer is central again. 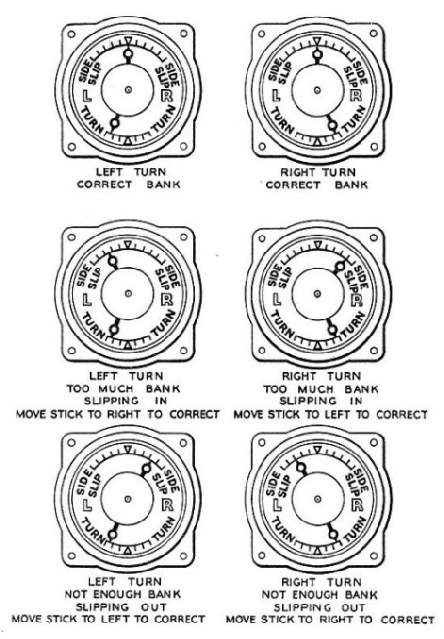 A TURN INDICATOR tells the pilot the direction in which he is turning, the relative speed of his turn and whether he is using the correct bank for the speed of the turn. The bottom needle of the pair indicates the turn,and the top needle is central when the bank is correct. Incorrect bank causes sideslip to one side or the other. For a straight flight the pilot keeps both pointers central. Because rate of turn can be judged from the Directional Gyro only by the speed at which the figures on the scale move, it is quite common for aeroplanes fitted with a Sperry-Horizon and a Directional Gyro to have a turn indicator as well. A ball bearing level need not be fitted to the Directional Gyro to indicate sideslip when a turn indicator is fitted to the aircraft. By using his blind flying instruments in conjunction with those used in normal flight, such as compass, air-speed indicator, altimeter and revolution counter, a pilot can follow a given course without once being able to see beyond his windscreen. Having completed his journey, however, and having arrived in the vicinity of his terminal aerodrome, the pilot has yet to bring his machine down to the aerodrome and make a landing. It is here that the popularly termed “blind landing” system is employed. “Radio-assisted approach” is a more accurate description of the system, for the ground must be visible from about 50 feet if the final touching down of the machine is to be correctly carried out. A number of suggestions for overcoming the need for this final visibility have been made, among which is the three-wheel undercarriage, and the time will come when completely blind landings can be made. There are different types of the radio-assisted approach systems. The Lorenz system is one of the most widely-used in Europe. By means of a radio beacon, a radio-defined path is extended out from the aerodrome in the best direction of approach for the aeroplane. Once the pilot has picked up this beacon an indicator tells him when he deviates from the approach path, and whether his deviation is to port or starboard. He is thus assured of flying straight towards the aerodrome. Apart from this directional guide path, there is also a radio-defined glide path which curves gently down to the aerodrome. By watching another indicator the pilot is able to keep his machine gliding on this path until the ground becomes visible; then he eases back the control column for a normal landing. RADIO INSTALLATION ON A WESTLAND WESSEX AIRCRAFT. Radio plays an important part in the safe navigation of aeroplanes through clouds and fog. The top dial visible on the pilot’s instrument board is a homing radio indicator and enables the pilot to fly direct to any radio station. Homing radio, also, is used for one system of blind approach to an aerodrome for landing. The special behaviour of ultra-short radio waves makes possible the production of these radio paths, and the explanatory diagrams (shown below) illustrate how the desired results are obtained. When a suitable radio reflector is created at the point X1, the contours of equal field-strength move to the right and become elongated as shown by the line B1. Similarly the reflector X2 will move the contours to B2. By connecting the reflectors in circuit alternately, the transmission is swung from B1 to B2. By completing the circuit of one reflector for short periods and the other for long, a distinctive note of successive dots or dashes will be sent out for each area. When the aeroplane is on the approach path, the reception from both areas will be equal, and the short and long periods will fit together into a continuous transmission of even strength. As soon as the aeroplane moves to either side of the true approach path, however, either the dots or the dashes will be received more strongly, according to the side on which the deviation has occurred. 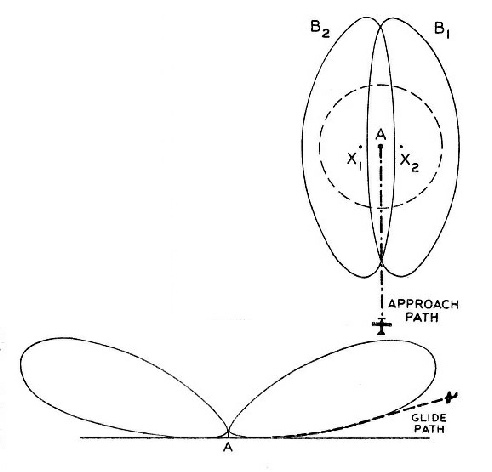 THE APPROACH PATH of the Lorenz system is illustrated by the diagram to the right. The pilot maintains his position on the approach path by keeping equal his reception of the radiations represented by the curves B1 and B2. The diagram below illustrates the principle of the glide path. By keeping reception strength constant, the pilot follows the radiation curve down to the aerodrome. The deviation is noted by the pilot aurally in his earphones, and visually on an instrument, and he is able to apply the necessary correction instantly. The lower of the explanatory diagrams illustrates how the glide path is achieved. Because of the influence of the earth, the ultra-shortwave radiations take a form resembling elongated eggs, rising away from the earth as the distance from the transmitter increases. The illustration shows a contour joining points of equal strength. that his aeroplane is below the proper glide path. In the Lorenz system the approach path and glide path are produced by one main beacon, but separate beacons have been used in other systems for the two purposes. Apart from the main beacon there are two marker beacons, one near the edge of the aerodrome and the other about two miles away. These marker beacons send up wedge-shaped radiations which cut across the approach path, and they are noted by the pilot both aurally and visually. They serve as a definite indication of his distance from the landing area. The pilot flying blind has first of all to get within the range of the approach-path transmissions, which is about fifteen miles from the aerodrome. He is assisted in this by normal two-way radio communication with the ground, and the use of bearings obtained by ordinary direction-finding methods. Once he is within range of the beacon his navigation is carried out wholly with the aid of the blind-flying radio installation. In front of him is a neat instrument with two dials and two lamps. One of the dials indicates the strength of reception of the main beacon and the other shows by means of a vertical needle when he is off the approach path. One of the lamps glows when he passes the first marker beacon and the other when he passes the second marker beacon. 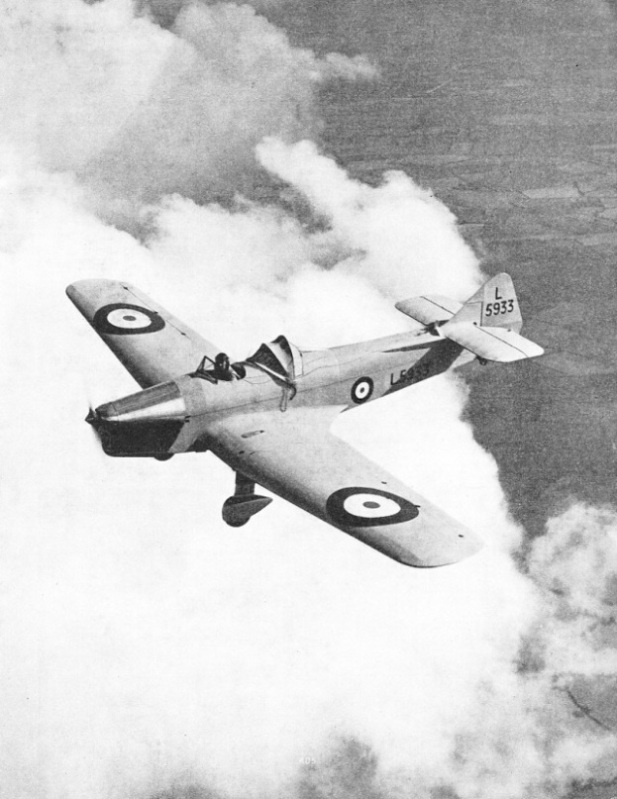 PRACTISING BLIND FLYING ABOVE THE CLOUDS in a Royal Air Force Miles Magister training machine. To simulate conditions of zero visibility the pilot, in the back seat, pulls a hood over his cockpit. An instructor, or another pilot flies in the front cockpit to check the accuracy of the flying and to keep a look-out for other aircraft. As soon as the main beacon is heard, the position of the vertical needle or the presence of a dot or dash signal in his earphones, informs him to which side of the approach path he is, and he flies in the right direction to get exactly on the approach path. From this stage onwards he must keep properly on the approach path the whole time by guidance from his received signals. By noting from the other dial the strength of reception he can obtain a rough estimate of his distance from the aerodrome. This is an important piece of information, for by the time he reaches the first, or outer marker beacon, it is necessary for him to be flying at a predetermined height. At the earlier stage of the approach he must concentrate on getting his machine to this height as quickly as possible. Having adjusted his height correctly, the pilot now maintains level, straight flight with the aid of his instruments until the first marker beacon is reached. This gives a characteristic sound in his earphones and also lights up one of the lamps. The pilot has to do two things at this stage; he has to put his machine into the correct gliding angle, and he must note the strength registered on his strength meter. By maintaining this strength at a constant level he will come correctly down the glide path. The noting of the strength at the time of passing the first marker beacon, and keeping to this instead of going by some previously decided strength, overcomes any troubles that might occur through variations from time to time in the transmitting and receiving apparatus. By this means the strength of the transmission and the efficiency of the receiver have to remain constant only during the short period of the approach. After a short period of gliding the aeroplane passes the second marker beacon. Another note is heard in the earphones and the other light glows. The pilot now knows that he is over the aerodrome and must keep a sharp lookout for the first view of the ground. From this point onwards the radio can be neglected, but he must still keep an eye on his other blind flying instruments to keep the machine level laterally and on a straight path until it touches the ground. There is an alternative method of controlling the descent path, which is preferred by some pilots. In practice, it has been found that the glide path may be distorted by land contours or obstructions near the aerodrome. Research on methods of improving the glide path are being carried out, although some pilots have every confidence in it and use it regularly. be at the second marker beacon. Therefore his sensitive altimeter will provide a check on his rate of descent as he passes the second marker beacon. The strength of the wind will affect the rate at which he should descend, but he can be informed of the wind speed by radio and make the necessary allowance. When controlling his descent in this manner, the pilot can still employ the approach beacon to keep his machine on the right path horizontally. Another system of radio assisted approach, developed in the United States, also uses this type of control of the descent. Two omni-directional beacons are provided, one at the boundary of the aerodrome and the other about a mile and three-quarters away from the aerodrome. The line joining the two beacons is the correct approach-path. The two beacons give vertical fan-shaped radiations as well as the omni-directional radiations. The pilot is thus able to know when he is directly over the beacons. The pilot uses homing radio, to fly to the outer beacon. Directly he is over the outer beacon he tunes in to the inner beacon and homes towards it. He thus follows the correct approach path. In some circumstances, with both the Lorenz and Hegenberger systems (those just described), pilots may follow a track which takes them over the marker beacons twice before landing. The object is to verify that their approach is correct in all respects. 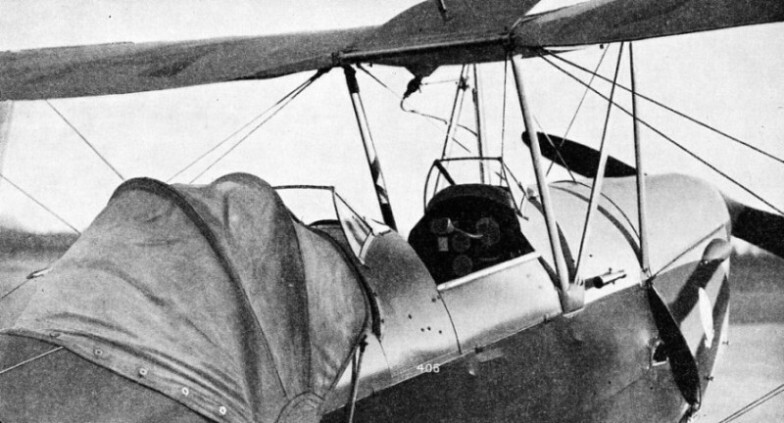 A TIGER MOTH EQUIPPED FOR BLIND FLYING INSTRUCTION. The hood is shown in the forward position over the back cockpit. This hood may be brought forward or put back by the pilot while the machine is in flight. It springs into either of these positions when it is moved. 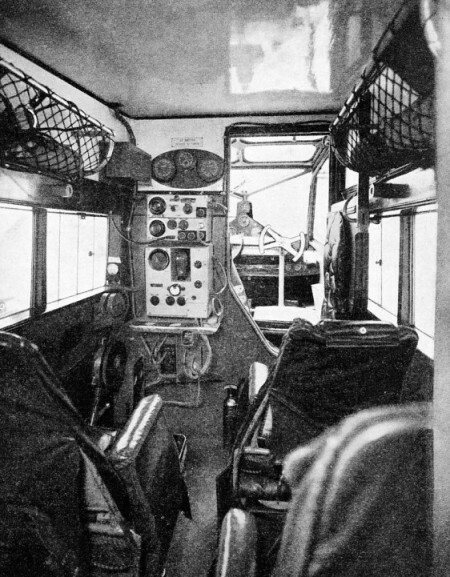 The instrument equipment in the back cockpit of this machine s similar to that shown in the colour plate shown above. You can read more about “Air Traffic Control”, “Fight Against Fog” and “Homing Radio” on this website.